Target Liberty: Will Danney Williams Run Against Chelsea Clinton in New York? Will Danney Williams Run Against Chelsea Clinton in New York? Rumors continue to circulate that Chelsea Clinton may seek a US House seat from New York. She may have a surprise opponent, Danney Williams, who believes he is the son of former President Bill Clinton. Some are even encouraging Williams to run for the US Senate from New York, a seat once held by Hillary Clinton. 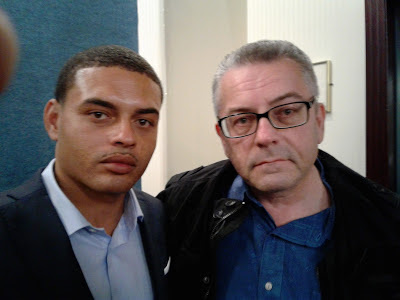 I met up with Danney at a press conference he held in Washington D.C. last year. He strikes me as a solid guy. I hope he runs. "Danney Williams, who believes he is the father of former President Bill Clinton." I could be wrong about this, but I thought Williams claims to be Clinton's son. You should have plucked a hair surreptitiously from him when you met with him. Then do so later with Bill Clinton. Compare DNA by lab. LOLOLOL. Chelsea isn't his sister. She's Hilary's daughter. He's Bill's son. Hilary and Bill Clinton have no children together as far as we know. If they ever did, Hilary probably killed them. NY contest: Clinton vs Hubbell.